Musings 'n scribblings of a philanthrope .. : Cycle time, takt time game played in class ..
Throughput time is the total time from the beginning of the process to the end of the process. This is defined by the process. 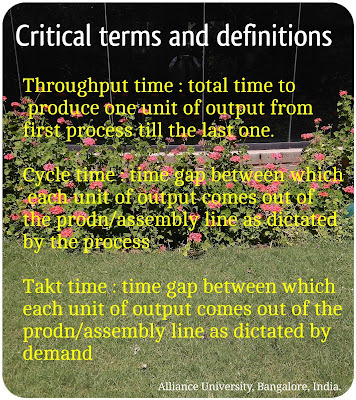 Cycle time is the time interval when successive units of output come out of the assembly line, as dictated by the process. 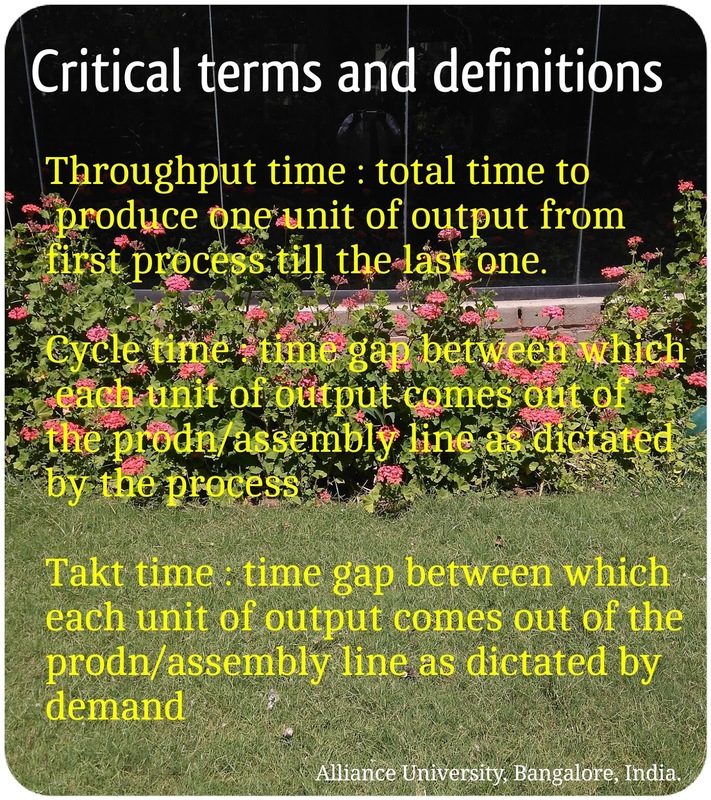 Takt time is the time interval when successive units of output comes out of the line, as dictated by the customer demand. For example it is said that an automobile comes out of the Toyota assemble line every 2.5 minutes. This is called the cycle time. THE CYCLE TIME IS DICTATED BY THE DURATION OF THE LONGEST PROCESSING STATION / PROCESS. It does not mean that the whole car assembly is over in 2 minutes. Theoretically speaking, it is the duration of the longest process workstation in the assembly process. The difference between cycle time and takt time is best illustrated by a game we play in the class trying to make a paper plane. In the class, a paper aeroplane making assembly line consisting of four workstations (members) is arranged. The second workstation makes the first two sets of folding (body work). The fourth workstation does the final painting work on the plane. The paints on the plane are dictated by the customer (customization) and are different. Customer Quality Inspecting agencies (five students) have the final say on the quality of the planes. The game is played for four different cycles. In the first cycle, the different manufacturers are free to manufacture how much ever planes they want to manufacture, in the given time of 2 minutes. All work-in-process (W-I-P) inventory and defects add to the cost of the process. In the other cycles, the customer decides how much to manufacture (dictated by the Takt time) and one can see, how the W-I-P and defects decrease and hence the costs reduce. All complete and good quality aeroplane brings in a revenue of Rs. 100,000 while all WIP and defects result in loss of Rs. 50,000 each. The final revenues per plane are calculated for each cycle (n * 100,000 - x * 50,000 ) / n, where n is the number of good quality planes produced per cycle and x is the total of all WIP and defects produced. Click here for the Game calculation worksheet ..
1. Which system incurs the lowest rate of defects ? Why ? By playing this game and calculating the average revenue per unit of output, it is found that the average cost per unit of output is lower in the case of pull system than the push system. When the customer demand was for 4 items per shift of 1 minute, the output was fairly uniform and of good quality for every team, all could get the output through, with zero WIP and zero defects. When the customer demand rose to eight per shift of 1 minute, the teams could get uniform good quality output of just 4-6 units. That was not an issue. But all the 4 - 6 units produced were of good quality. 2. Find which system of production incurs the lowest cost and comment. If the costs and revenue are calculated, it is found that the Pull system of production incurs, the lowest cost as the output is of uniformly good quality with least of WIP and defects. 1. The output in the push system was found to be of a low quality and majorly had to be rejected. 2. The output in pull system was based on the customer demand. In case (b), the customer demand production target was for just four units, which all teams produced this FG successfully with the best quality. 3. In case (c), pull system with customer demand production target of 8, majority of the teams produced between 4-6 units in a shift. There were some WIP, but no defects. All the FG was found to be of the best quality. 1. lower production costs per unit compared to the push system. 3. low returns due to low defects. P.S. : The author wishes to acknowledge the efforts of the students of sem 4, MBA, Alliance University Bangalore, 2016-18, for playing the game.